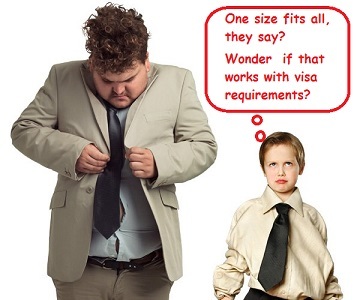 There’s a common misconception out there that “visa requirements” are a one-size-fits all. The other one is that gathering essential visa documents is a really simple process. The Department website has very very basic information on it about what’s needed, and we get people who come in and say “Oh, and we have everything!” They don’t! In all the time Down Under Visa have been in practice, we’ve never even once had a client come in and have everything prepared! Where does the “What are my requirements?” thinking come from in Philippines? The Philippines is a country of OFW’s. Overseas Filipino Workers. Filipina and Filipino workers go to Hong Kong, Saudi, Dubai, etc to work. Mostly they do underpaid menial tasks that the locals don’t want to do. Drivers, housemaids, etc. I have the greatest respect for OFW’s, by the way. They sacrifice so much for their families. The recruiters give out lists of “requirements”, and yes those lists ARE simple and standard. Passport, birth certificate, NBI Clearance. Nothing unique. And here most families have someone working overseas, so everyone knows they have to run around and gather up a few documents from a list. Getting a visa to Australia is not the same. Not at all. These OFW countries need workers, and they basically just need to know who you are and that you are healthy and not a criminal. With Australia? You have to prove to the Australian Embassy or Department of Immigration staff that you meet the criteria set out in the Migration Regulations for that visa type set out in Law. If they are not convinced, then by Law they must refuse your application. It’s not a mere formality. The onus is on you to convince them absolutely, or you will most certainly face a refusal of the visa application. Is there a “standard list” of visa requirements? Not for our clients, because our clients pay us to prepare an excellent visa application that leaves the Case Officers in no doubt as to the genuineness of your relationship and that you definitely meet all the Regulations. And honestly? I could say that 80% of the value in an application would be the documents and the relationship evidence! Tossing a few photos and a handful of emails will not convince anybody in the Australian Embassy in Manila (or the Department of Immigration in Australia) that your relationship is genuine as well as the other criteria for identity and character. Easily 80% of the value and 80% of the work is getting the requirements absolutely right. So what do you get if you’re a Down Under Visa client? You get a personalized To-Do List which matches your own (ie. both applicant and sponsor) personal situation and history, and it’s very detailed with all the explanatory documents and video instructions to help you to get it right. And you have us there to guide you with anything you’re not sure about. And what’s more, once we receive your documents/requirements we check them over thoroughly for correctness, accuracy, quality and quantity. If anything is not right, we will normally pick it up and will let you know. And we will give you a hard time about it until it’s right, because that’s all part of our job. We want your application to be as close to flawless as possible. And the end-results show, because we have a remarkable success rate. And at the end of the day, this is what you’re paying us for. You want your Australian partner visa application and/or Australian tourist visa application approved, and you want that visa in your hot little hands. So that’s why you don’t need to ask “What are my visa requirements?” Once you become our client we’ll do much better than that, and we will take excellent care of you. Great place for Australian Filipina couples? Tagaytay! i want to know what r does needed to become qualified for tourist visa? just for about 1 to 3 months stay with family friends. thank you for your kind and consideration. Not easy when it’s to visit friends. We specialise in applications for couples. Hello Jacy. Once you become our client, we can help you with that. To lodge an effective application you need a list of requirements that suits your individual situation. Please use the visa assessment form on the website. I got refused today.what should i do? Leizel, you had signed up to do a visa with us in November and we never heard back from you. I would suggest you start again and let us manage the application for you properly. I would like to ask what are the document I’ll be needing for applying tourist visa for me and my daughter? My mom is already a Australian citizen. what could be my supporting document needed for me and my daughter so we can visit her? That steps well and truly into the realms of professional work. If you would like help, please use the Visa Assessment Form on the main website. And note that we apply for visas from the Philippines only.